Wales legend Scott Gibbs says they must beat Fiji and Australia in the World Cup or their stunning Pool A win over England "counts for nothing". 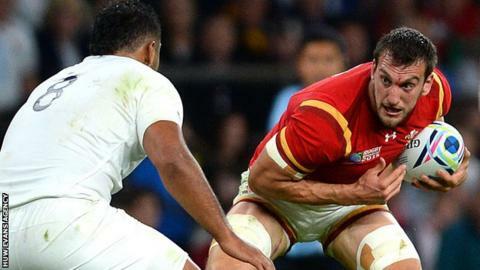 Warren Gatland's side can take another step towards the quarter-finals against Fiji on Thursday. Their last group game is against Australia on 10 October. "We've all celebrated in the last few days," said Gibbs. "But it counts for nothing unless we win on Thursday and go unbeaten throughout this group." Gibbs, 44, starred for the British and Irish Lions as they beat South Africa in 1997 and also played for the Wales and Great Britain rugby league teams during a glittering career. He famously scored a last-minute try at Wembley when Wales beat England 32-21 in the 1999 Five Nations Championship. The former Ospreys and Swansea centre added: "The nation is behind them - they just need to play smart football, conserve energy and probably put the pressure on Fiji to play rugby." Meanwhile, Wales centre Jamie Roberts says once-capped centre Tyler Morgan, 20, can impress on his World Cup debut after being called in to replace the injured Scott Williams. "He was unlucky to make the squad in the first place," said Roberts. "He's a very explosive player, a young guy who's very enthusiastic and he has to put that into 80 minutes. "He's a talented fella and he'll fit straight in. "He's got experience around him with myself and Dan [Biggar at fly-half] and George [North] and Alex [Cuthbert] as well. "It's the same for Matthew Morgan [at full-back]. "He comes into a backline with a lot of experience and just has to take care of his own job and the rest will happen for him." Roberts felt Fiji could also have beaten England in the tournament opener had a crucial moment gone their way. "I thought they played some great stuff and when [Niko] Matawalu's try was disallowed, that was a massive, massive turning point in that game," said the Harlequins player. "If they'd have scored then, I really feel they might have gone on and won it. "I've played against quite a few of those lads in the Top 14 and they're serious rugby players and serious athletes." But will Welsh history repeat itself? Fiji captain Akapusi Qera, 31, starred in their back row as they dumped Wales out of the 2007 tournament in Nantes. He said: "It's the best memory ever so far in my rugby career. "For me as a young boy coming into that big tournament and to win and get qualified for the quarter-finals, it was a major, major boost in my rugby career. "And maybe that's why I'm still hanging around for a few a couple more years in order to replicate that history."